Day 9, this page is another CD envelope so that I'm able to hide some journaling or photos or whatever I want. On the cover I kept it simple and left another spot to journal on. On the insert, I did a simple clock and quote that I wanted to remember. On the flip side of the envelope, I used this really cute polka dot textured paper and wrapped the ribbon around it so that I could use the ribbon slide. I like that it is sweet & simple. On this last page I used a design tip from my all time favorite scrapbook artist: Ali Edwards. I used four photos, punched them out using my square punch, and arranged them into the square pattern that you see above. 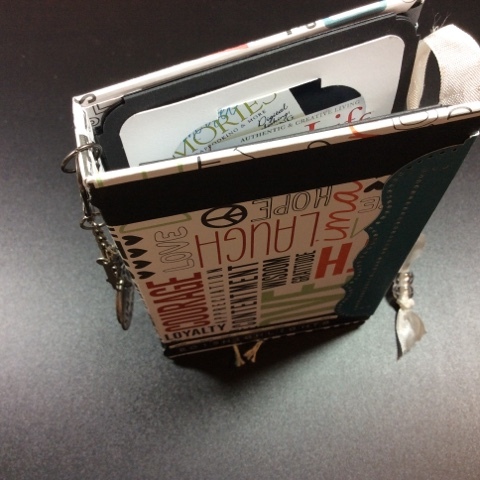 It makes a striking statement, I like this design and have used it several times on regular scrap layouts. Well that's all, more coming tomorrow, and possibly something extra that's un-related to this album the following day.